Departure*: This trip departs from G Dock in Ventura Harbor promptly @ Mdnt. Be on Board no later then 11:30pm. These trips are specifically catered to the intermediate to advanced level diver that wants to hunt halibut. Dive sites are typically flat and sandy areas where halibut frequent. These trips are best suited to divers, that have experience in rougher cold water conditions including; current, swell, kelp, limited visibility and long swims. Non-hunters may sign up for these trips, but the dive sight choices will be based on the best hunting areas not necessarily the best dive conditions. We leave the dock at Midnight, Boarding is on Sunday night. Be on Board by 11:30pm on Sunday night because the boat leaves promptly at Midnight. We plan to return home around 6pm on Tuesday. This trip includes 1 entire day of scuba diving (sun-up to sun-down). The 2nd day will offer between 3 and 4 scuba dives, before the trip home. This trip includes 2 days of scuba diving, air fills and meals. You will need to provide all scuba & snorkeling equipment including weights and 1 tank. 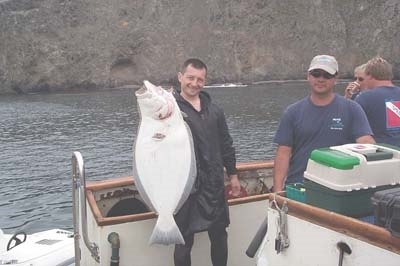 Our Halibut Hunt trips are the perfect escape for the avid hunter. 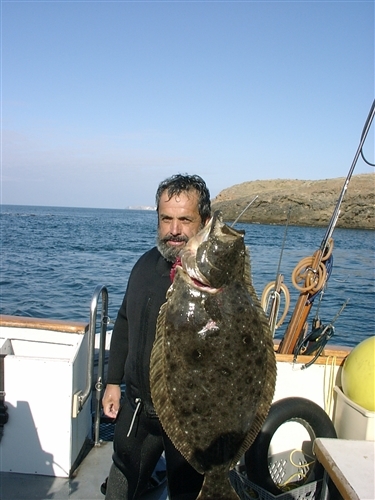 The Channel Islands offers the perfect habitat for halibut hunting with its large sandy bays that are the perfect halibut habitat.